Pentagon: A pentagon is a five-sided polygon. Click on the blue points and drag them to change the figurel. Manipulative 1 - Pentagon Created with GeoGebra. A pentagon is a five-sided polygon. A regular pentagon is a five-sided equilateral polygon. Click on the blue points in manipulatives 1 and 2 and drag them to change the figure. Why are only two points shown in the figure? Manipulative 2 - Regular Pentagon Created with GeoGebra. Click on the blue points and drag them to change the figure. Click on the check boxes to see the various properties of a pentagon. Manipulative 3 - Properties of a Pentagon Created with GeoGebra. The center of a pentagon can be found at the intersection of the perpendicular bisectors of any two sides. There are many tilings in pentagonal patterns and tilings that use pentagons. See below. The central angle of a pentagon measures 72° or 2π/5 radians. The central angle is the angle between two line segments from the center of the pentagon to two adjacent vertices. See manipulative 2. The internal angle of a pentagon measures 108° or 3π/5 radians. The internal angle is the angle between two sides on the inside of the pentagon. The area of a regular pentagon in terms of one of it sides is . The apothem of a regular pentagon is a line segment from the midpoint of one side of the pentagon to the pentagon's center. There are many geometric nets that include pentagons. See below. Figure 1: Tiling of a pentagon. Courtesy John Savard. 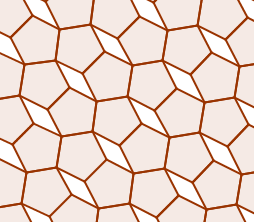 Figure 2: Tiling of a pentagon. Wolchover, Natalie. 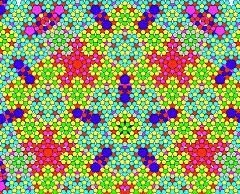 Pentagon Tiling Proof Solves Century-Old Math Problem . https://www.quantamagazine.org. Quanta Magazine. 12/3/2018. https://www.quantamagazine.org/pentagon-tiling-proof-solves-century-old-math-problem-20170711/. McAdams, David E. Pentagon . 12/21/2018. All Math Words Encyclopedia. Life is a Story Problem LLC. http://www.allmathwords.org/en/p/pentagon.html.